How Can I Get Better Yield From My Pepper Plants? 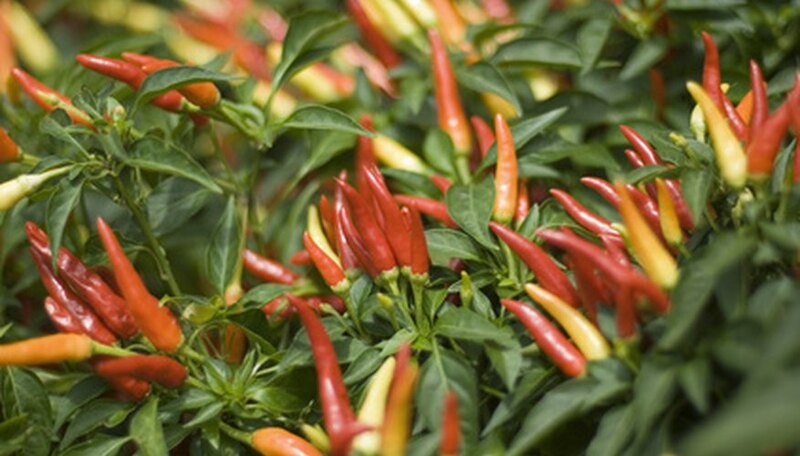 Make sure the growing conditions are right for your peppers to produce a good vegetable yield. They need consistently hot weather and plenty of water to produce good fruit size. Peppers can be relatively slow-growing compared to other vegetables. Keep in mind that yield also depends on the variety of peppers you are growing, and that you should always follow variety-specific directions for sun requirements and climate suitability. In other words, not all peppers grow well in all locations. Consult your local agricultural extension office or local vegetable nurseries if you aren’t sure what peppers grow well in your area. Add compost to the soil. Before even planting peppers, be sure they will have a rich soil to grow in. Applying compost or aged manure to the bed where you plan to grow peppers is a good idea in the spring. Mix it well, and dig the bed at least a foot deep to give the plants good rooting space. Plant your peppers after the last frost date outdoors. Space them about a foot apart from each other in every direction. If you are planting in rows, leave a foot in between neighboring pepper plants, to allow best growth and yield. Cramping the pepper plants has been shown to reduce yields, as has planting them too far apart. Fertilize the young plants with a balanced fertilizer like 10-10-10. After this first round of fertilization, don’t add any more throughout the growing season, because adding more nitrogen will encourage greenery production and height growth, not pepper yield. Mulch around the bases of the plants, leaving some room between the stem and the mulch in a circle, to avoid rot and disease. Use mulch that can be easily wetted during watering and will hold moisture well, such as grass clippings or shredded newspaper. This will help the plants hold moisture through hot days, increasing their yield. Weed frequently. Peppers take a while to grow large, and often are outcompeted by weeds in the spring before they are strong. Weeds in the peppers’ territory will use needed water and nutrients, and spread disease to the young peppers. Dig up weeds by hand with garden gloves and a hand cultivator to avoid damaging the tender peppers with a hoe or spade. Enclose the young plants. Use wire cages, such as those for tomatoes, around each pepper plant when it is young, to serve as a support for a plastic enclosure. This technique boosts yields considerably. Wrap the plastic around the bottom half of the cage, creating a greenhouse-like environment for the plant. Remove the cages in late May. Protect the peppers from sunburn and water loss. Some pepper producers use netting or landscape cloth to shade the peppers during the hottest part of the day when they are young, such as in spring. You can do this between about 10 a.m. and 4 p.m. if you want to increase your pepper yield in very hot climates. However, stop shading the plants once they flower, as they need top-down sunlight to set fruit well. Pinch off early flowers. The pepper plants may begin blooming quite early in the year, but pinch off flowers that form before June, to increase the fruit production throughout the summer. In areas with long growing seasons, you also can pick off immature pepper pods before they ripen, which will reduce the fruit “weight” on the plant and allow it to produce other, bigger pods. Take preventative measures to avoid diseases. Fusarium and verticilium wilts are particularly lethal to pepper plants. Work to prevent them by not planting peppers in soil that previously housed any other solanaceous crops, such as potatoes, tomatoes and eggplant. Weed carefully, as many weeds carry the soilborne fungi that cause these wilts. Destroy any infected plants, and avoid overwatering in cool temperatures, which encourages fungi.